On one of my groups our challenge for last week was to create a card using any of SU's new Silhouette Stamps - so Jane if you're reading this - surprise - here's your challenge card. 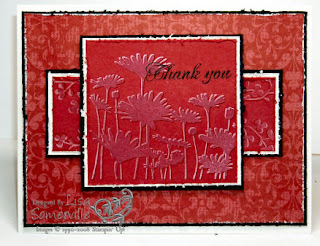 For this card I used the Faux Dry Embossing for my focal image, and also on the flower leaves on the long panel. oooooooh, Lisa! this is SO pretty!! resplendent! pulchritudinous! Pretty!!! Jane will love this! Wow Lisa, this is really spectacular!